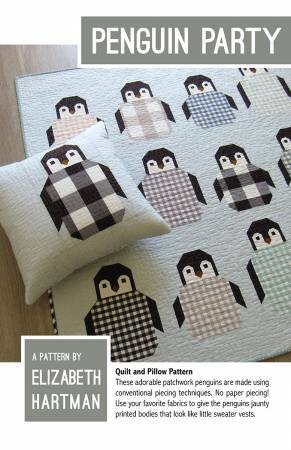 The Penguin Party pattern by Elizabeth Hartman may be used to make quilts and/or pillows featuring adorable penguins. Only traditional patchwork techniques are used to make the blocks, so there is no paper piecing or templates. Pattern includes instructions for three sizes: 50" x 50" child's quilt, 60" x 60" lap quilt and a 20" x 20" pillow.